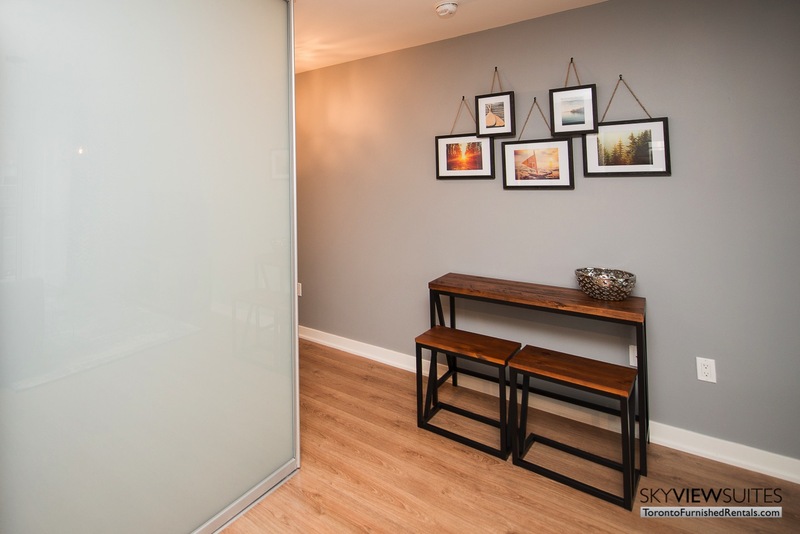 This King West apartment is the perfect space for guests looking for a modern and inviting furnished rental. 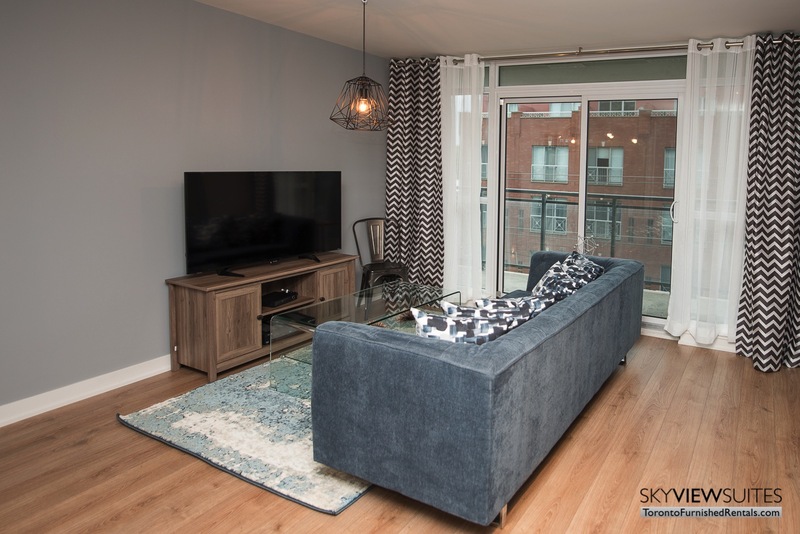 With an open concept, contemporary finishes like honey coloured hardwood floors and stainless steel appliances you won’t want to leave once your stay has ended. 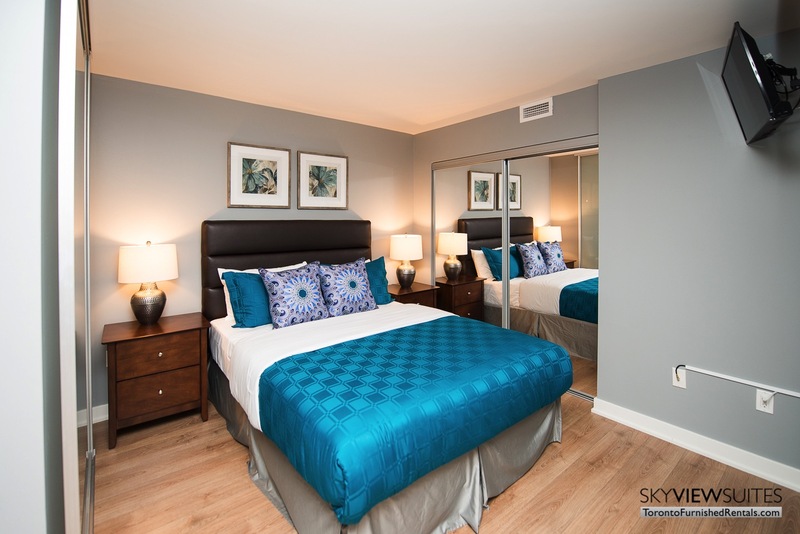 This 550 square foot luxury suite is ready to accommodate guests looking for a comfortable temporary place to stay in Toronto. The main living space features a plush grey couch, entertainment centre and rustic design elements. Guests are encouraged to sit back and relax after a long day out in the city and enjoy their Rogers VIP cable package. This main room also permits access to the private balcony of the unit. Guests can see down to the landscaped courtyard below and because the unit does not directly face the street, the balcony is much quieter than most in the city. 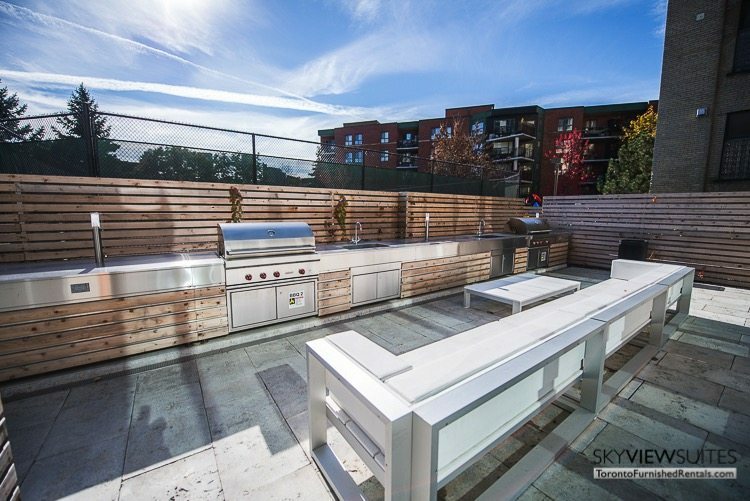 Cooks will love the stylish and functional kitchen of this short term rental. All of the appliances contained in this kitchen are stainless steel, clean and up to date. 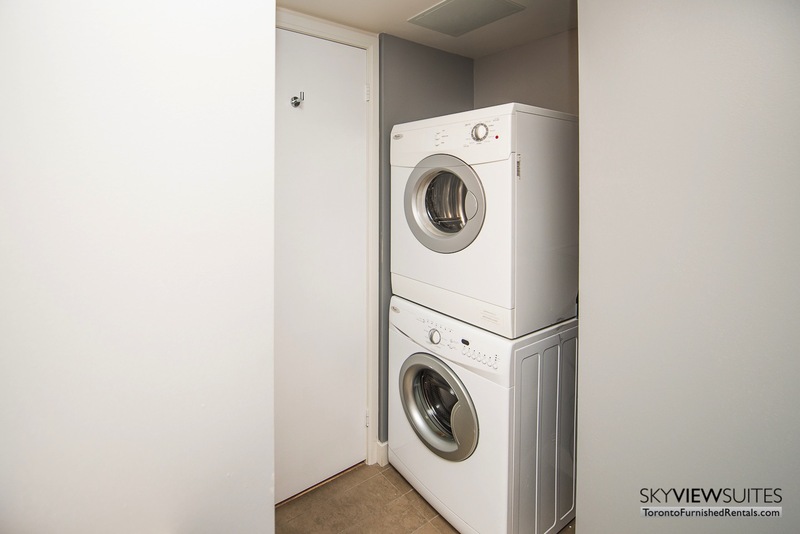 Smaller appliances such as a toaster, coffee maker and microwave are also included for guests to use. Essentials like cutlery, drinking glasses and dishes can also be found in this space. 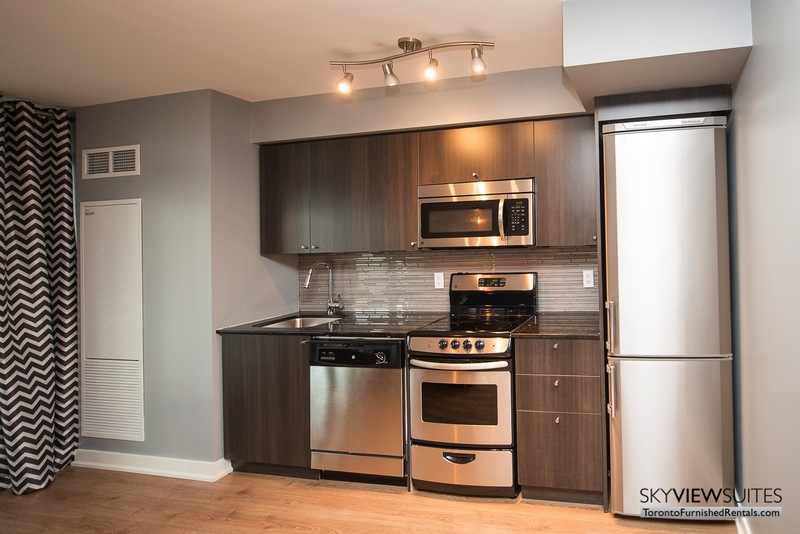 Our fully stocked kitchens mean guests don’t have to bring any kitchen ware with them when they move in. The bedroom features a comfortable full sized bed with all the required sheets and linens provided. The bedroom also features a large closet that provides ample storage during your stay. A sliding door encloses the bedroom for privacy when needed or opens it up for an open concept feel. 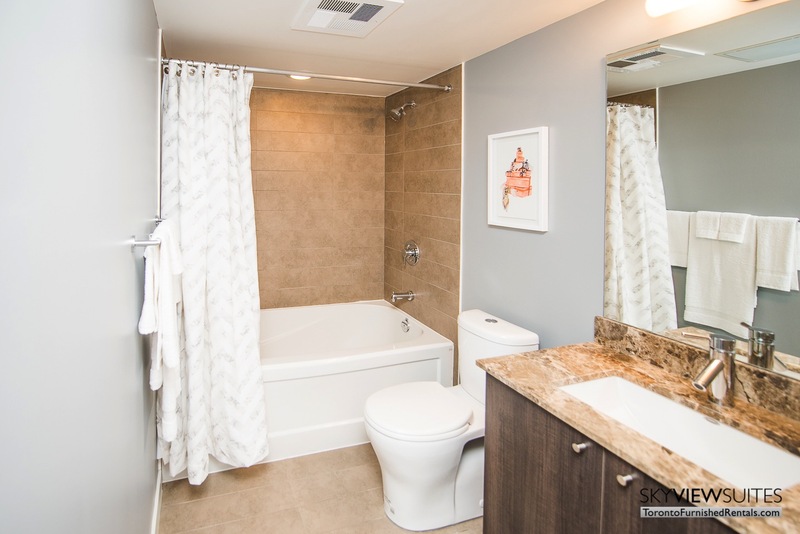 This unit also features a bathroom that houses a shower/bathtub combination, vanity sink with storage beneath it as well as the unit’s ensuite washer and dryer. 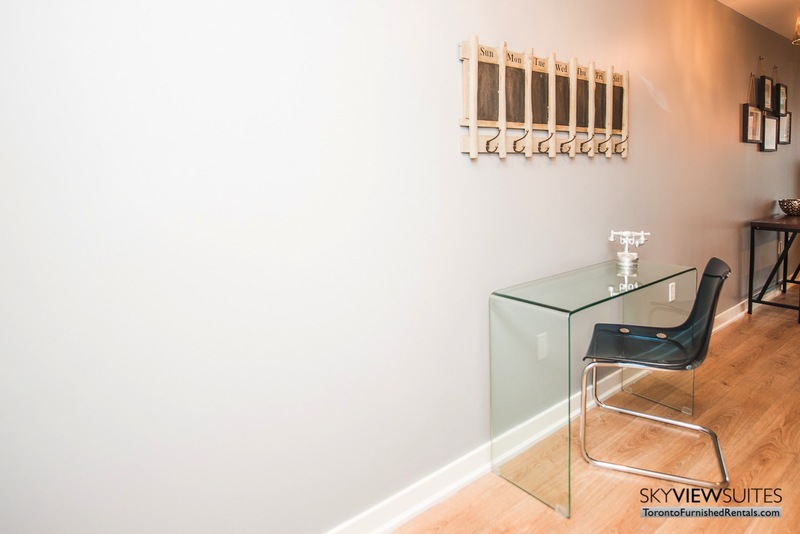 Those interested in this unit should also look at another Toronto furnished apartment we offer in the building. Corporate guests will enjoy this suite’s location and it’s proximity to the downtown Toronto core. Located on King Street just west of Bathurst, the King West is right in the heart of everything. Toronto’s King West Village is considered one of Toronto’s fastest growing and trendiest neighbourhoods. The neighbourhood is popular with young urban professionals and businesses alike and sure to suit the needs of guests. 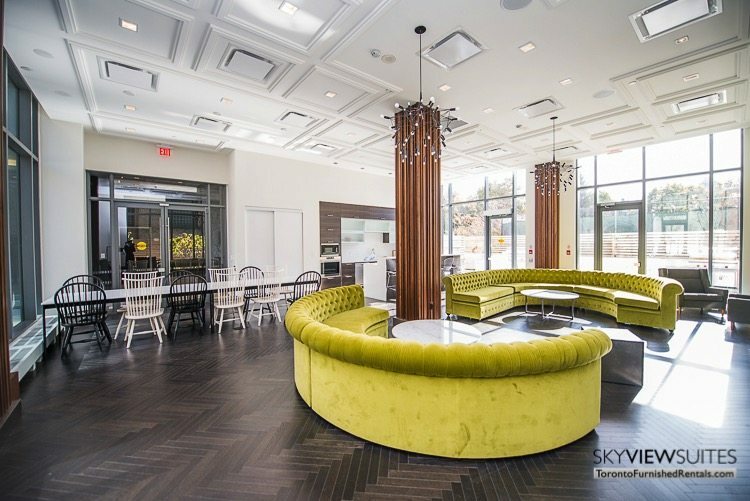 It is steps from public transit in a neighbourhood that is home to some of the city’s best restaurants, shops and entertainment venues. If you are a fan of Spanish food and Tapas restaurants you will definitely want to check out Patria Tapas Bar. No matter the reason for your stay, this neighbourhood is sure to have something for everyone. This building is one of Toronto’s LEED certified “green” buildings. This means the building incorporates innovative technologies to improve energy efficiency and promote long-term sustainability. The building’s main entrance sits off the main street making it a quieter private space. 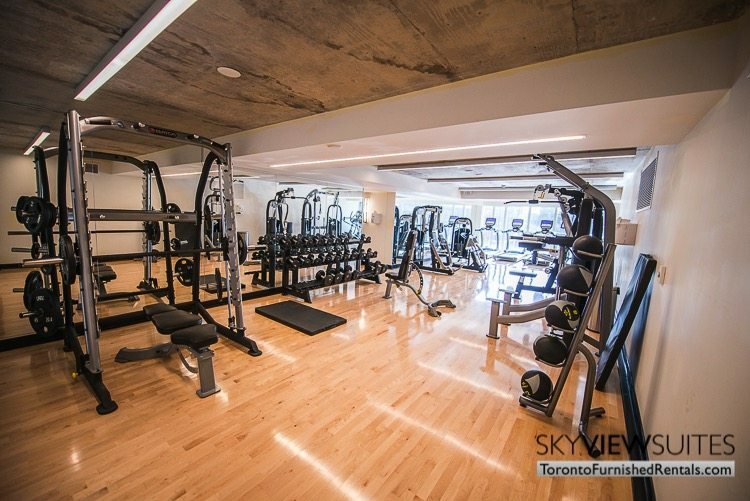 It also offers an array of amazing amenities to residents, including a beautiful outdoor courtyard and a fully equipped fitness facility.